With the first one, hinge Limits and angularMotor work very well, but with the other constructor the physic explodes when it reaches limits ! Jezek, I can send you a test if you want to check by yourself. Maybe I should also post on Bullet forum ? I looked into code and this particular constructor is not used in any demo, also HingeConstraint is same in both 2.66 and 2.67. So I think it might be bug in upstream, you should post there as well (in new thread). First of all, thanks Jezek for such impressive effort. I just PM'ed the moderator to make this topic sticky. Small advice: moving trimeshes (GIMPACT), BulletMultiThreaded, BulletColladaConverter are not part of the core Bullet but optional Extras. btContinuousDynamicsWorld is currently work-in-progress, so I recommend waiting to port that and focus first on the remaining parts of the core parts in the Bullet/src folder. The constructor was created before the hinge limit contribution was added. It doesn't properly support hinge limits indeed. The pivot+axis doesn't provide a full frame, so the limits are ambiguous. If we change the implementation, we break backwards compatibility. Please discuss details in the Bullet forums, we will sort it out. I've written a jPCT-implementation of IGL, but a very limited one. It can play the basic demo but that's it (i.e. it can only draw cubes). It was just meant as a proof of concept and as a training exercise if it's actually possible to develop on the Asus EEEPC...it is! To use jBullet (great work btw...multithreading would be a cool addition) with a 3d engine, one shouldn't use the demo framework IMHO, because it's bound too much to the way how OpenGL does things. However, it IS possible to use it anyway...as you can see. That looks nice. What method is used for the real-time shadows? Do you have a link to the source code/demo? jME http://www.jmonkeyengine.com/ would like to utilize this physics library. Currently it is using a java port of ODE, if included this would be another available physics library. I was wondering a couple of things though. How are you going to handle Bullet updates? and What is the the state of this current endeavor. If it is still going to be changed quite a bit, would it be better to wait to implement it with jME? Anyways, basixs is right overall - awesome work! any eta for a kind of release/stable or similar? After base features will be ported, I would like to keep syncing with newer versions. It seems that differencies of code between versions are not that big. The API will be changing a little in some versions, both because of Java port and original Bullet. But nothing significant I think. Therefore, I don't think you should wait with using JBullet. ... any eta for a kind of release/stable or similar? No ETA is set, but I think that base features will be ported in month or two. I would like to switch to a new, more "official" versioning scheme that matches the original Bullet version, eg. 2.67-1, where 2.67 is original Bullet version and 1 is Java port version for that Bullet version. It will increase when bugfixes or other enhancements are made in Java version, or when some yet unported code was ported (eg. from extras). @jezek2, I was wondering if you could clarify something for me. 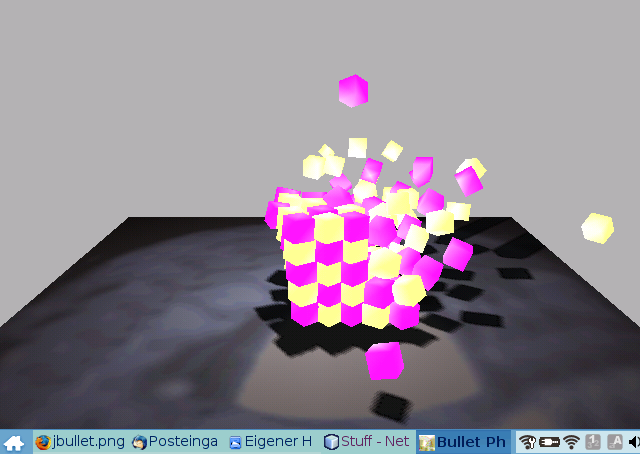 I've been trying to link my rendering engine to javabullet to test it without the debug drawer. However, when I create a box with half extent <1, 1, 1>, to get the visuals right, I need to draw a cube with side lengths 1. Do half extents in bullet represent actual side lengths or half the dimension (as the name seems to imply)? Just for your info: I have added this feature now. Jerez: I would wait porting the upcoming soft body dynamics, it is work-in-progress. There are some important fixes in btConeTwistConstraint, btQuaternion and RagdollDemo that you might need to integrate in the Java version. Jezek, I have the same fixes available for jbullet. With a mtn status or mtn diff I can see the changes. How I can commit safely just one file (I've have some other files I've changed for some test) ? Thanks for your advice, nice stuff btw! I'll probably still leave JBullet on 2.66 for some time, with exception of important fixes like these. And in some near future I'll upgrade directly to 2.68.
ok, HingeConstraint fix should be commited. This looks like bug in GNU Trove itself, try latest version of it. I've seen that they fixed some bug with retainEntries in newer version. If that doesn't help you can try to remove it from classpath, JBullet will then use normal HashMap. BTW: thanks for the commit, I will just fix minor divergence of the code style to match other code (the else blocks starts on same line as '}'). With trove-2.0.3, I can't reproduce it so it was a trove bug. Any news on jbullet porting ? Is still there issues for 2.66 or you have started on 2.68 sync ? I think I'll look on AxisSweep3 and then convert everything already ported to 2.68, so the gap is not opening that much. I have been playing with the port, and it looks great. I ported the HelloWorld.cpp application, since I'm interested in a non-interactive simulation for some of my work. The port was trivial as I basically did the same change as in BasicDemo. I can email it to anyone who wants it but it only takes about 5 minutes. Running time is about the same for them, but it ends so quickly that it is not a good measure. The good news is that the numerical results are exactly the same for the first 100 steps between Bullet and JBullet (100 steps is the default). My question would be whether this in general would be true? After 110 steps, they seem to diverge, with an X value creeping in with JBullet. I didn't know if that was a numerical stability issue with this particular simulation, or a more general issue. Thanks for JBullet in any case! Nice to hear If you wish you can contribute it, just remember to put your real name in the copyright and use the ZLIB license header like other files. You can send me it to my e-mail (with subject that contains "JBullet"). I'm guessing that it's because there isn't a 64-bit image in the jnilib. Java 6 on Mac is only 64-bit so all JNI must be 64-bit as well. So , is JBullet physic deterministic? - Changed package from "javabullet" to "com.bulletphysics"
- Converted to use output parameter when returning vectors, etc. The rabbits that you shoot out are pretty cool in the new Concave demo. But I was wondering, are the walls meant to do anything? Is it possible to use JBullet with JOGL?